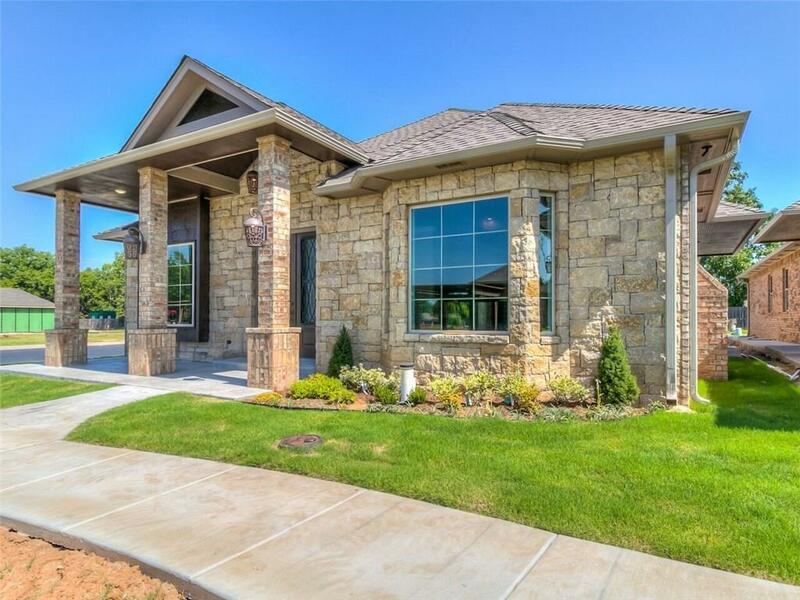 Luxury home, in gated community, designed for those who want to enjoy a carefree home with high-end comfort. This home is exquisite! Quality construction throughout. This home is an open floor plan featuring many amenities: Gourmet kitchen with granite counters, SS appliances, generous cabinet space, walk-in pantry, large kitchen island and box window over sink for natural light. Breakfast room bumps out with a box window with a view. Open living area with stunning built in book case and a Bay Window that provides an abundance of natural light. Master bedroom is private with an extra large bathroom with 2 walk-in closets, separate shower with jetted tub and dual sinks. Half bath doubles as Storm Shelter and Safe Room. Garage with epoxy floor, storage area and utility sink. Additional amenities include: security and sprinkler system. Conveniently located near Tinker AFB, parks, golf courses, restaurants and medical facilities. HOA maintains lawns, gated entry and all common areas.